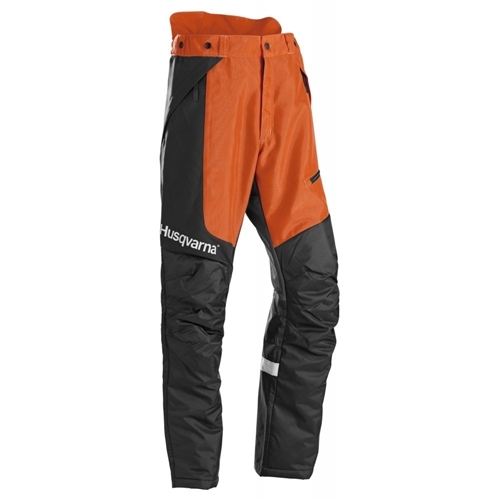 Work in comfort with these brushcutter trousers from Husqvarna. The Technical Brushcutting/Trimming Trousers benefit from additional padding to help provide protection against thrown debris, while the use of extra-treated fabric and water-resistant material in the lower leg make them ideal for working on wet grass. They include additional reinforcement where necessary, with ventilation zippers to the back of the legs and pre-bent knees ensuring excellent manoeuvrability and comfort. Thanks to the bright orange fabric and reflective strips and logos, they also help you to remain visible in darker conditions.